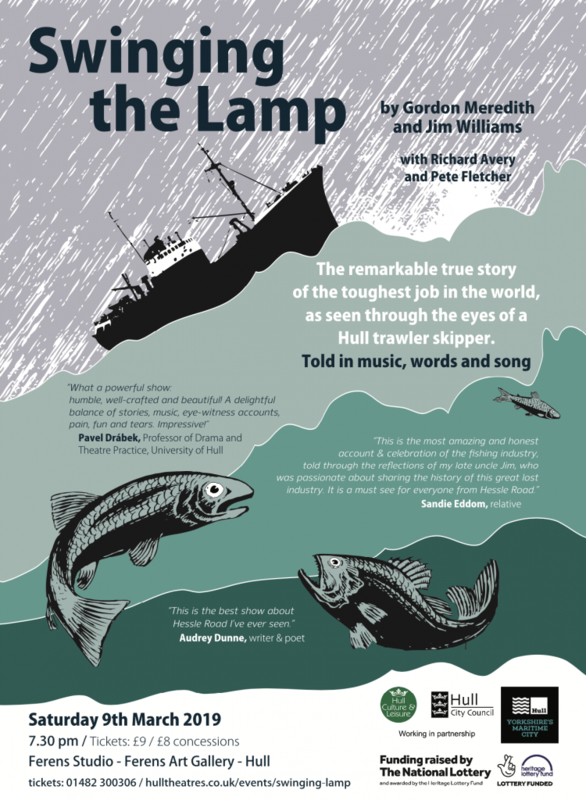 The dramatic ‘Swinging the Lamp’ will take place at Ferens Art Gallery on Saturday 9 March, 7pm and is part story-telling, part theatre and part folk music, evoking life as it was in the fishing communities of Hull and Grimsby and remembering the life of skipper Jim Williams. Swinging The Lamp, by Gordon Meredith and Jim Williams. “But it is essentially Hull’s story as seen through the eyes of one of the city’s best loved and most respected trawler men, Jim Williams. It was originally conceived and performed in Beverley but its heart is in Hull and that is where I have always wanted to stage it. Two special performances of Swinging the Lamp are also taking place on Thursday 7 March on-board the Arctic Corsair. This is the first time a theatrical performance has taken place in this unique setting, testing how creative events can take place on the historic trawler. Be the first to comment on "Ferens Art Gallery to host Swinging the Lamp"